Plantar fasciitis often occurs in middle-age. It also occurs in people who spend long hours standing on their feet at work, like athletes or soldiers. It can happen in one foot or both feet. It is common in sports like long distance running, dancing etc. Athletes who overpronate (rolling in or flattening feet) are especially at risk as the biomechanics of their feet place more stress to the band. Plantar fasciitis can take a long time to heal. Six months is the average time reported in medical research. There are some who will get cured after a few weeks and for others it will take more than a year. It can also become a chronic condition in which case some sort of treatment will always be needed to prevent the pain from coming back. As sooner as the condition is treated chances are it will not get chronic or in other words if you treat plantar fasciitis sooner you will get cured faster. Plantar fasciitis is usually controlled with conservative treatment. Following control of the pain and inflammation an orthotic (a custom made shoe insert) will be used to stabilize your foot and prevent a recurrence. Over 98% of the time heel spurs and plantar fasciitis can be controlled by this treatment and surgery can be avoided. The orthotic prevents excess pronation and prevents lengthening of the plantar fascia and continued tearing of the fascia. Usually a slight heel lift and a firm shank in the shoe will also help to reduce the severity of this problem. The office visit will be used for careful examination and review to distinguish plantar fasciitis and plantar heel pain syndrome from other problems, many of which are outlined below. It is important to distinguish between a stress reaction of the calcaneus and plantar fasciitis. A feature of many calcaneal stress fractures is pain on lateral and medial compression of the calcaneus. When some people stand/walk/run/jump their own anatomy in their ankle joint is not ‘sturdy’ enough to cope with the needed stabilisation of their ankle joint when they are weight bearing. So, their ankle rotates to find a point of stability. 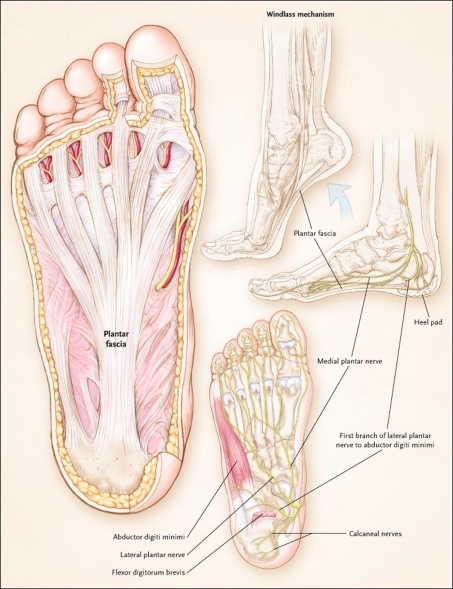 By the shin twisting in and the ankle rotating downwards to the inside (along with your body weight, the power of some muscles, and of course, gravity) a huge amount of stress is applied to the plantar fascia until it is stressed beyond it’s normal limits and it starts to ‘tighten up’. It is this tightening up of the plantar fascia under this stress that causes the damage that in turn leads to pain…eventually. More than 90% of patients with plantar fasciitis will improve within 10 months of starting simple treatment methods. Rest. Decreasing or even stopping the activities that make the pain worse is the first step in reducing the pain. You may need to stop athletic activities where your feet pound on hard surfaces (for example, running or step aerobics). Ice. Rolling your foot over a cold water bottle or ice for 20 minutes is effective. This can be done 3 to 4 times a day. Nonsteroidal anti-inflammatory medication. Drugs such as ibuprofen or naproxen reduce pain and inflammation. Using the medication for more than 1 month should be reviewed with your primary care doctor. Exercise. Plantar fasciitis is aggravated by tight muscles in your feet and calves. Stretching your calves and plantar fascia is the most effective way to relieve the pain that comes with this condition. Cortisone injections. Cortisone, a type of steroid, is a powerful anti-inflammatory medication. It can be injected into the plantar fascia to reduce inflammation and pain. Your doctor may limit your injections. Multiple steroid injections can cause the plantar fascia to rupture (tear), which can lead to a flat foot and chronic pain. Soft heel pads can provide extra support. Supportive shoes and orthotics. Shoes with thick soles and extra cushioning can reduce pain with standing and walking. As you step and your heel strikes the ground, a significant amount of tension is placed on the fascia, which causes microtrauma (tiny tears in the tissue). A cushioned shoe or insert reduces this tension and the microtrauma that occurs with every step. Soft silicone heel pads are inexpensive and work by elevating and cushioning your heel. Pre-made or custom orthotics (shoe inserts) are also helpful. Night splints. Most people sleep with their feet pointed down. This relaxes the plantar fascia and is one of the reasons for morning heel pain. A night splint stretches the plantar fascia while you sleep. Although it can be difficult to sleep with, a night splint is very effective and does not have to be used once the pain is gone. Physical therapy. Your doctor may suggest that you work with a physical therapist on an exercise program that focuses on stretching your calf muscles and plantar fascia. In addition to exercises like the ones mentioned above, a physical therapy program may involve specialized ice treatments, massage, and medication to decrease inflammation around the plantar fascia. Extracorporeal shockwave therapy (ESWT). During this procedure, high-energy shockwave impulses stimulate the healing process in damaged plantar fascia tissue. ESWT has not shown consistent results and, therefore, is not commonly performed. ESWT is noninvasive-it does not require a surgical incision. Because of the minimal risk involved, ESWT is sometimes tried before surgery is considered.